I have often wanted a Visio map of the world, with countries that can be linked to data. There are a number of Visio country shapes that are available for download on the internet, but they are fairly old, and certainly don’t have an up to date world. For example, South Sudan is currently the newest country in the world (2011), though a lot of resources on the web don’t show it. So, I was relieved to find a good SVG world map at http://commons.wikimedia.org/wiki/File:BlankMap-FlatWorld6.svg?uselang=en-gb . Even better was that each of the shapes are named with the ISO2 code. This meant that I could use Link Data to Shapes to automatically create Shape Data from an Excel worksheet that I put together from various sources. Note that I had to add Kosovo manually, since it was not on the original map, as it’s status as a country is in dispute. The ISO codes have apparently been temporarily assigned. The advantage of having this map available in Visio as separate countries, means that it can be used for a variety of reasons, and can be linked to other data sources easily. For example, I have simply added an extra data link to an Excel worksheet that contained a list of the countries where the European Bank of Reconstruction and Development ( http://www.ebrd.com ) operates. This was made with Visio 2013, so you might be trying to open with an earlier version. It works for me. Question: How do we open the external data view? I also tried to use the same source svg file. I couldn’t figure out how to get visio (2010 Professional) to map in the ISO 2 codes in the SVG file to the shapes – I tried looking through developer mode without much luck. (I’m a newbie to visio) any advice/pointers? Are you trying to download the Visio 2010 or Visio 2013 version? Hi how can I change the data so that the countries change colour depending on the rep responsible for that sales region? If you have another worksheet with a column for any of the country codes and one for the sales reps. name, then you can add the Sales Reps name to each shape using Link Data to Shapes and Automatically link using the country code as the key. You can then use Color By Value by the Sales Reps name, and add a legend. 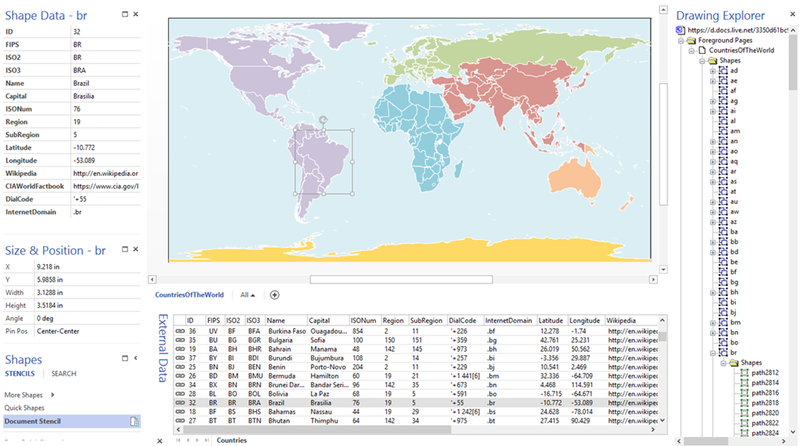 See https://blog.bvisual.net/2014/01/27/visio-map-of-the-world-update/ for an example. Thank you for making the diagram available. I’m looking to use this as a base to display user numbers globally broken down by timezone/city or state and graphically display as dot with a label. Any guidance you would be appreciated. My map only goes down to country level, but you can do similar with other levels, if you can find vector files to convert, such as SVG.. I have updated nmy original map to make adding labels easier, see https://blog.bvisual.net/2014/01/27/visio-map-of-the-world-update/ for an example. Good day, I’ve download the BlankMap provided by the link in your post. When I try and open it in Visio 2007 I get a msg,”The file was opened but some problems were encountered. Details of the problems were added to the log file.”. I’m not sure what to do to fix this error. That is because it is a Visio 2013 document. Here is a link for a Visio 2003-2010 version, http://1drv.ms/1kBO8kX, that I have just created for you. in 2010 version i cant see all of the continents, for example australia and americas. Well, I just tried it using Visio 2010, and it seemed OK to me. It is a 5 mb file in 2010, so could you have run out of memory? The author put a double extension on at least one of the files. You just have to delete the .vdx and leave it as BlankWorld.vsd and the file will open without problems. Hope that comment helps some of you! Which links? I just tried all of them and they worked for me…. Подскажите пожалуйста можно ли вставить в VISIO карту отдельного государства с городами. Если можно, то как это сделать? Буду очень признательна. Для работы очень нужно!